BEDAWI is your local responsible travel partner in Egypt's Sinai since 2007. We avoid mass tourism and we take you safely to the most beautiful natural sites. Exploring our travel offer and our website is a journey in itself... Ya Marhab! - Welcome! Sharm el Sheikh has got it all: The Red Sea with its beautiful underwaterworld, beaches and 360 days of sunshine. No wonder so many people love to spend their holidays here. But what if you don't want to lay on a sunbed with hundreds of others and just want to enjoy the natural attractions of Sharm el Sheikh? Reviewed by Lonely Planet as Top Choice to stay at the National Park Ras Mohammed. The Red Sea offers some of the best sites in the world for snorkeling, diving or free diving. The National Park Ras Mohamed is one of the best places in the world. You can now opt to stay inside the National Park and enjoy it all. You can dive straight from the shore with your guide and enjoy a thoroughly relaxed experience in this amazing underwater world teeming with life. 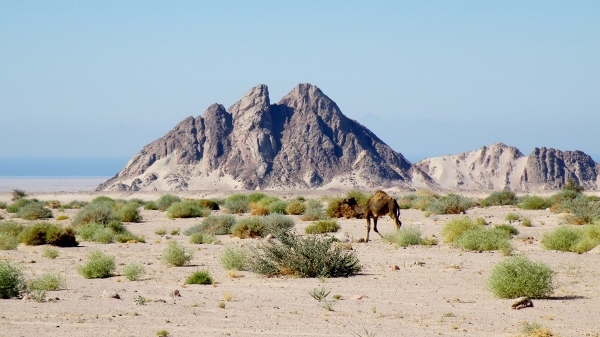 The Sinai desert and its seas seem initially deserted nature, but in fact these are worlds full of life and the only catalyst that determines the movement of this eco system is the balance of water. You stay at an Eco lodge in the High Mountains of the Sinai Peninsula and enjoy the famous Bedouin hospitality. Experience freedom, spaciousness and total silence like these can only be found in the desert. You walk, ride on a camel or in a jeep and climb through canyons under guidance of your Bedouin guide. A great adventure for the whole family with a combination of activity, teamwork, sun, fun and relaxation. Discover an ancient burial chamber from the Bronze Age, a pharaonic temple, ancient turquoise mines, trace the first alphabet created by Nabataeans. Visit the oldest continuously inhabited monastery in the world while you walk in the footsteps of the Prophet Moses and discover the Bedouin life in Sinai. It is virtually impossible to describe the Sinai desert when you feel the gentle rhythm of your camel while you silently pass by colorful sandstone, natural springs in fertile wadis and majestic granite mountains. A desert safari by camel refreshes your mind, lifts your spirit, gives you room for new thoughts. 2. A new window opens in your browser, in a secure environment. 3. Leave your message and hit the 'Send' button. 4. You receive a copy of your message and we reply to you by E-mail.